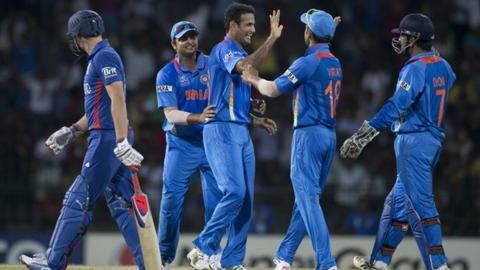 Captain Stuart Broad claimed England's batsmen do not have a weakness against spin bowling despite their collapse against India at the World Twenty20. England, who had already qualified for the next phase, were bowled out for 80, their lowest T20 score, to fall to their heaviest defeat in the format. "We just played particularly badly. I've seen the guys play spin extremely well, certainly in training," he said. "We've had a really bad day but it doesn't affect our destiny." England's huge win over Afghanistan in their opening match of the tournament meant they had already secured their place in the Super Eights, and they opted to make a change for Sunday's match in Colombo. Luke Wright: "Sorry to the fans for a terrible batting performance! One bad game, we will bounce back! Thanks to everyone who is still right behind us!" Tim Bresnan: "Apologies to the England faithful supporters. That wasn't our best game. We will bounce back stronger I'm sure." Pace bowler Tim Bresnan came in for Samit Patel, leaving sole spinner, Graeme Swann, as the only England bowler to concede fewer than eight runs per over in India's total of 170-4. "We wanted to have a look at a different balance of side," Broad told BBC Sport. "We've seen the wickets in Sri Lanka have offered a bit for the seamers and we can't be too disappointed at conceding 170 on this ground." In reply, England lost Alex Hales to an ugly slog in the first over and then spinners Harbhajan Singh and Piyush Chawla took control with combined figures of 6-25. "There are a lot of batsmen who don't look like they're in any kind of nick. Only three made double figures, including Jade Dernbach and he's not picked for his batting. It's going to be a blow to the solar plexus, but it's not going to matter that much as long as the players and management can get over it. Other teams will be looking at their squads, thinking 'how many spinners have we got?' and think 'we should play them all against England'." "Our error today was we lost early wickets," said Broad. "Spinners always enjoy bowling to new batsmen. "We talked the other day how well we hit straight and hard. Today to lose the first couple of wickets across the line was a bit disappointing. "But you learn from your mistakes, and we'll certainly bear that in mind when we come across a wicket like that again. England are next in action on Thursday against West Indies or Ireland, who play for a place in the Super Eights on Monday, with Sri Lanka and New Zealand also waiting in Group E.
"Hopefully we'll perform better in the games that matter coming up," added Broad. "We'll still get on the bus to Kandy tomorrow, but we wanted to put a better performance in than that. "I don't think the guys' confidence will take too much of a knock from this. It doesn't change where we go. "We still need to play well on Thursday and I think we can do that." Broad's opposite number Mahendra Dhoni sympathised with England's difficulties in the subcontinent and said he expected them to improve. "It is something that is a bit new and different to them," he said. "In the subcontinent, at times when it starts turning the ball really stops - so you have to be really careful when playing those drives. "It is a bit different, compared with England. But they are a very good side that has done really well in the last year. So you will see them adapt to conditions and get better in the future." India advance to Group F, where they will join Australia, South Africa and Pakistan or Bangladesh.